I knew that I would be participating in Alida's Starry Bright Sky QAL. So far, I'm up-to-date on my blocks, even if my June block was a mess. 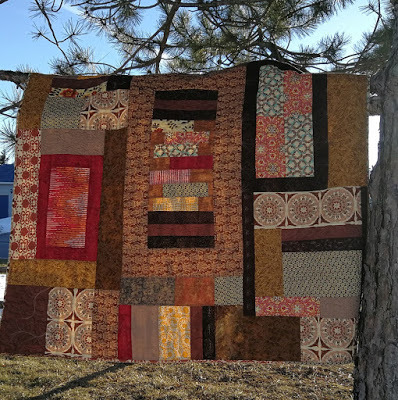 I was seriously considering participating in Block of the Month Series presented by Bernina and even bought loads of Alison Glass fabric for it. Although it's a lovely quilt, I think that it's the colours and the fabric that impressed me the most. I will use that yummy fabric but I've decided to minimize the amount of traditional quilting - as in following a pattern - that I'm going to do. I joined my second Postcard from Sweden QAL, this time hosted by mmm! quilts. I'm happy to report that my quilt top is finally done! 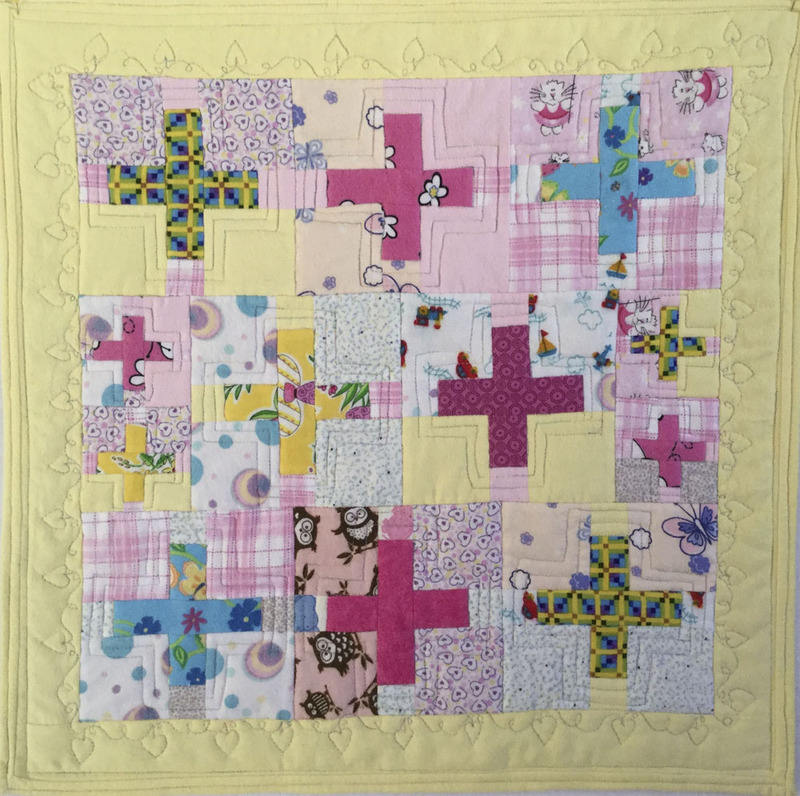 Also, I combined my wanting to make charity quilts with Amy's Comfort QAL in April. I adapted the simple pattern to make 2 lovely charity cuddle quilts. 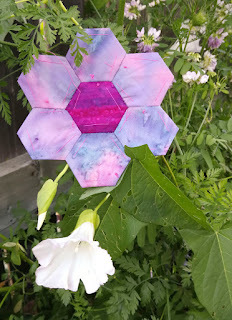 I did join the Kingfisher Stitch Along since it's all about making a very simple quilt with hexie flowers. I'm still crazy about hexies but I wanted to make them as part of a larger piece. I've had lots of fun photographing the hexie flowers in nature and slowly hand-appliquéing the hexies onto the diamonds. 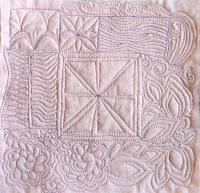 Since I wanted to keep practicing my FMQ, I joined Angela Walter's FMQ Challenge QAL. That was a lot of work but I really enjoyed it. Here's the square where I practiced most of the FMQ designs. I've slowly been updating my blog like I wanted to. Many are just minor changes, like using consistent headings and post formats. All best practices of writing for the web that I've learned at work. I've also created more pages for the blog, highlighting the projects that I've completed in each year. Pages for 2014 to 2017 have been created using my InLinkz tool. I only have 2012-13 left to do. I've created a Linking Parties and Events page to help me keep track of dates as well as make it easier to post buttons on the side of my blog. I've learned a lot and am hoping to create a Tips for working in Blogger page sometime this year. 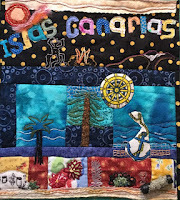 On my holidays in January, I worked on some embroidery as well an art quilt. 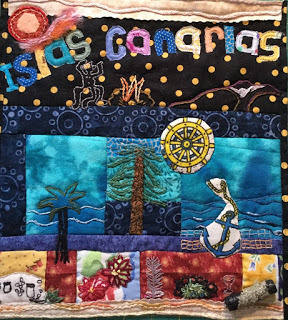 Isles Canarias was my first art quilt of 2018. 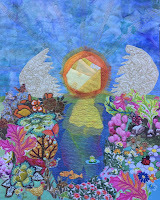 As I hoped, I made another art quilt, Morning Has Broken, for Alida's Art with Fabric Blog Hop. I was able to exhibit my art quilts at both Fibre Fling 7 and the Common Thread Quilt Guild's quilt show. These two pieces are 2 of my best pieces to date. I am currently working on an art quilt for a show for next summer with the Out of the Box Art Group. It needs to be finished by the end of September and is coming along nicely. This category wasn't in my 2018 plan but I'm adding it here since I also managed to finish 2 UFOs. 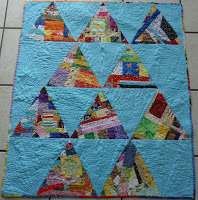 Street Art My Way (2014) and Scrappy Triangles Baby Quilt (2015). Wow! I can't believe all that I've accomplished!!! And mostly without too much pressure. I wasn't sure how true that was so I went through my posts. 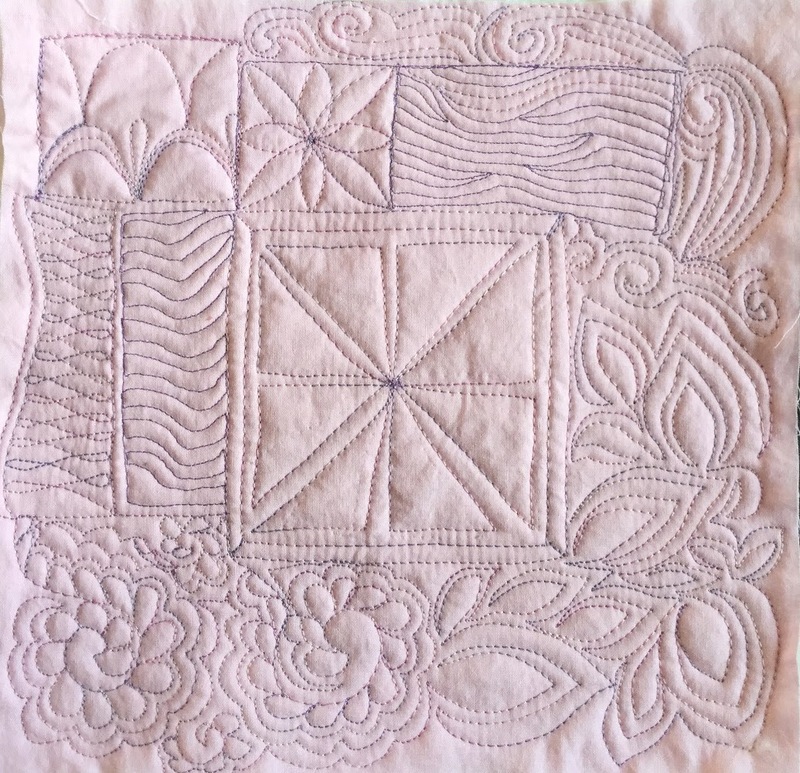 May was the usual busy month with the Art with Fabric Blog Hop and a quilt show, but otherwise I seem to have done pretty well keeping the pressure down. If I'm productive, it's because I try to quilt every day, as long as I'm not too tired. I've discovered that since I don't watch television, I have lots of time to quilt or read. I don't often spend much time on the computer since I work at one all day, but I get my small doses of Instagram and reading blogs a few times a week. Since I work on many projects at a time, I can choose which project to work on in the evening based on how much energy I have. I've been doing this for about four years now and my quilting has really improved. Thanks so much Yvonne for hosting this. A good review makes us think about what we've been doing in the last few months, not just in the last few days. I was a very worthwhile exercise. Merci beaucoup Frédérique, it has been a productive half year! Ooh - I like how you used the linkedin tool to do your finishes pages. Neat! Wow! You have been a productive lady! I like your pages so much! Congratulations on such a wonderful first half of your year! Thank you so much Miaismine! I find being creative on the blog almost as enjoyable as making stuff with fabric! It's really been a great first half of the year. I'm glad that I took the time to review! Hi Dione. I found that Blogger is pretty finicky to use but I'm determined to make it work for me!